Home Drinks Tea Can You Really Overdose on Tea? People have been drinking tea for thousands of years; in fact there are records of tea drinking that date back to the 2nd century BC, where the people of the Han Dynasty used it as a medicine. Today tea is still widely thought of as a healthy drink and studies have shown that it can help to fight cancer, boost your immune system, fight the signs of aging, stimulate blood flow and tons more. 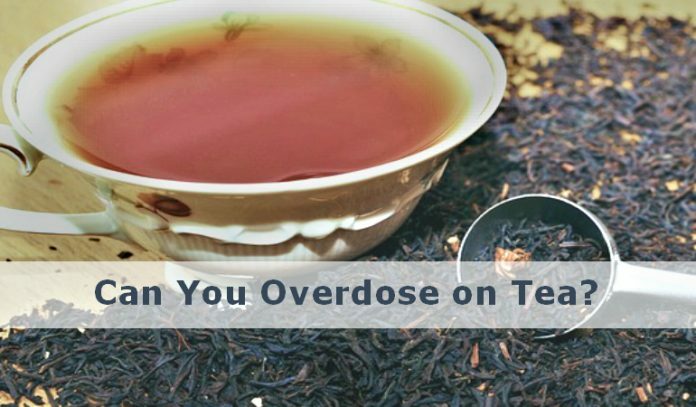 But the burning question is, can you drink too much and overdose on tea? In this article I’ll be covering that very question and looking the negative side effects of drinking too much tea. Can You Drink Too Much of it? Tea is rich in caffeine, flavan-3-ols and fluoride. If it is consumed in moderate amounts, these nutrients can enhance your health in a number of ways. But, if you go over the top and have too much of them, then the health benefits are lost and the nutrients in tea can actually have a negative impact on your system. So, yes it is possible to drink too much tea. As I have mentioned above, tea is a powerful source of three main nutrients – caffeine, flavan-3-ols and fluoride. Caffeine Overdose Symptoms: Caffeine has both mild and major side effects. Drinking between 300mg and 700mg of caffeine per day (which is the equivalent of 10-20 cups of tea each day) can lead to minor side effects such as an increased heart rate, frequent urination and restlessness. Drinking over 700mg of caffeine per day (which is the equivalent of 20+ cups of tea each day) can lead to major side effects such as confusion, disorientation and loss of consciousness. Flavan-3-Ol Overdose Symptoms: Drinking over 4,000mg of the flavan-3-ol epigallocatechin gallate (which is the equivalent of 20 cups of green tea per day) can stimulate free radical damage in the body and also interfere with cancer fighting drugs. Fluoride Overdose Symptoms: Drinking over 8mg of fluoride (which is the equivalent of 16 cups of tea per day) can lead to abdominal pain, convulsions, heart attacks, nausea and weakness. How Much Tea Can You Safely Drink? The minimum consumption level for caffeine overdose = 10 cups of tea per day. The minimum consumption level for flavan-3-ol overdose = 20 cups of green tea per day. The minimum consumption level for fluoride overdose = 16 cups of tea per day. If you limit your intake of tea up to 10 cups per day, you can enjoy numerous health benefits without experiencing any of the negative side effects listed above. So by all means enjoy a few cups of this hot, refreshing beverage on a daily basis just don’t go overboard. If for any reason you intend downing loads of tea, or coffee for that matter, get along to your doctor or medical advisor, tell them why you are doing it and ask them if it’s ok.
Next articleCan Antioxidants Protect Against Cancer?